The Heritage Conference baseball championship game has been set for Monday, May 13 at First Commonwealth Bank Field in Homer City at 7:00 pm. In other baseball/softball news, the annual Teddy Bear Fund Drive Softball and Baseball game between Indiana and Homer Center will be Saturday, April 20th at First Commonwealth Bank Field. The Heritage Conference announced its All-Conference teams for boys' basketball, girls' basketball, wrestling, and cheerleading on Thursday. Selection Process - The Heritage Conference recognizes these individuals who have qualified for the P.I.A.A. State Meet or have been selected by their school. Each school sets it own criteria for selection. Baseball: Saltsburg 14, Blairsville 1; Homer-Center 17, Harmony 0; Ligonier Valley 12, United 2; Northern Cambria prevailed over Purchase Line; West Shamokin topped Penns Manor. Softball: Marion Center 8, Indiana 7; Ligonier Valley 20, United 0; Penns Manor downed West Shamokin; Northern Cambria shut out Purchase Line. 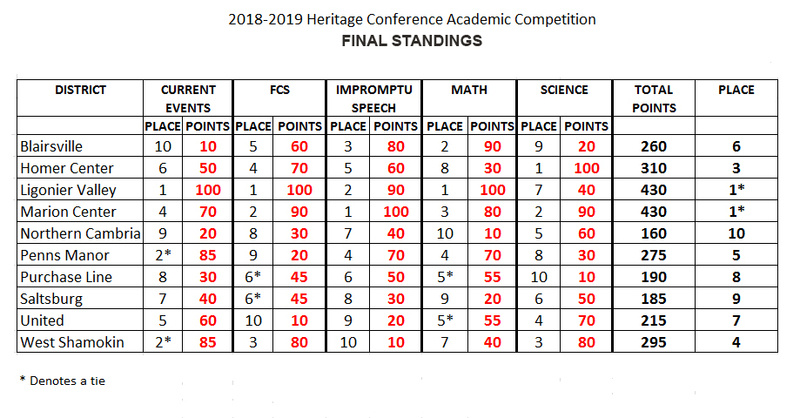 The following are the results for the Heritage Conference academics competitions recently held by the conference. Congratulations to co-champions Marion Center and Ligonier Valley. The United Lions went all the way to the District 6 A championship game last fall and now two of their standouts have signed to play college football. At a ceremony Thursday at United High School, Mason Muir signed to play football at Grove City and Joe Turek signed to play football at Lock Haven. Read more here. The Penn Manor Comets defeated the Blairsville Bobcats, 51-41, to win the conference championship and end the Road to the KCAC (presented by S&T Bank) on the girls' side. Blairsville led, 10-5, after one quarter, but Penns Manor outscored the Bobcats, 17-9 and 17-11, in the second and third quarters, respectively.Abby Tomayko led Penns Manor with 15 points, as the Comets made eight 3-points shots. Lauren Bagley scored 12 points and Autumn Fennell finished with 11 points. Blairsville's Sidney McCully scored 12 points to lead Blairsville and Caitlin Walbeck added 11. In the boys game, Ligonier Valley prevailed, 66-42, in a battle with the West Shamokin Wolves. The Wolves jumped out to a 4-0 lead to start the game, but the Rams answered with an 8-0 run and never trailed again. They held a 26-14 lead at the half and put 18 points on the board in the third quarter. Marrek Paola scored 31 points for the Rams. The Rams repeated as champions. The Heriitage Conference released its all-conference teams for the 2018 fall season today. Click here to see the full teams. The United Lions ended their season in the District 6A championship game with a loss to Juniata Valley, 36-20. Hunter Cameron rushed for 135 yards and touchdown in the loss. The Ligonier Valley Rams defeated Shade 45-8 for their third consecutive Appalachian Conference championship. Kyrie Miller rushed for two touchdowns and Cage Dowden caught two touchdown passes. This Friday, November 2, the District 6 football playoff game between United and Purchase Line will now be played at Indiana High Schools' Kuzneski Field, which has an artificial surface. The move comes as the weather forecast calls for rain on Wednesday, Thursday and Friday, and the playing surface at United's Thomas J. Madill Field could be very muddy by Friday. Game time is still 7 p.m. The game can be heard on U92.5 FM and streaming on the TribLive High School Sports Network from U92radio.com. Airtime is 6:15 p.m. The Ligonier Valley Rams clinced their third straight Heritage Conference championship with a 49-6 win over Northern Cambria on Oct. 12, then beat Blairsville by the same score to secure a third straight season undefeated in the conference. The Rams take on Shade on Saturday, Oct. 27 in the Appalachian Bowl. The Marion Center boys and girls repeated as Heritage Conference cross country team champions Thursday, and for the girls, it was their 18th team championship. Marion Center junior Hunter Armstrong repeated as the boys’ individual championship with a time of 17:28.5. Marion Center freshman Nevada Armstrong, at 20:19.0, unseated last year’s champion, teammate MacKenzie Walker, who finished second. Penns Manor and Purchase Line finished second and third, respectively, in the girls’ race. United and West Shamokin took second and third, respectively, in the boys’ race. Ligonier Valley won the conference golf championship by one stroke with a score fo 430, followed by West Shamokin (431), Northern Cambria (442), Homer-Center (443), Saltsburg (537) and Blairsville (554). All-Conference honors went to (Boys) Chris Ober of Homer-Center (75), Tanner Pershing of Northern Cambria (77), Nate Zik of West Shamokin (81), Jon Rankin of Ligonier Valley (81), Collin Moore of United (85) and Eric Spencer of West Shamokin (85), and (Girls) Kendra Pecora of Ligonier Valley (85), Molly Sisitki of Blairsville (112), Macey Davison of Northern Cambria (112), Blake Tonkin of Blairsville (115), Hannah Muir of Saltsburg (122) and Maddy Pierce of Ligonier Valley (122). The Heritage Conference and West Pac announce the Heritage Conference-West Pac Challenge presented by First Commonwealth Bank is back for the third consecutive year. The crossover games will be hosted by the West Pac and will be played Friday, October 26. The Heritage-West Pac Challenge culminates with the Appalachian Bowl Championship Game between the champions of each league on Saturday, October 27 at Windber Stadium at 7:00 pm.